Paper instruments were certainly much more common in the 16th century than it might appear from surviving examples. Except when they were included in books, such instruments are now very rare, but Philippe Danfrie was one maker who took a special interest in them. They were intended to be cut out and pasted on to board or pasteboard, and they offered a cheap alternative for those who could not afford the expense of brass. The advantage for the maker, of course, was that one engraving would suffice for many instruments, but he had to have mastered the skill of engraving in reverse. 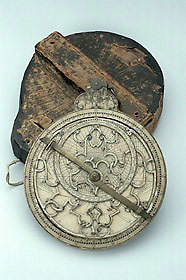 The fact that this paper astrolabe is signed has allowed an unsigned metal astrolabe in the collection of the Museum of the History of Science in Oxford to be attributed to Danfrie: see Epact 63059.